Running in Shenzen, China. 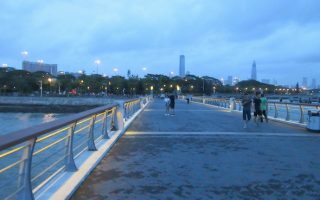 Best routes and places to run in Shenzen. 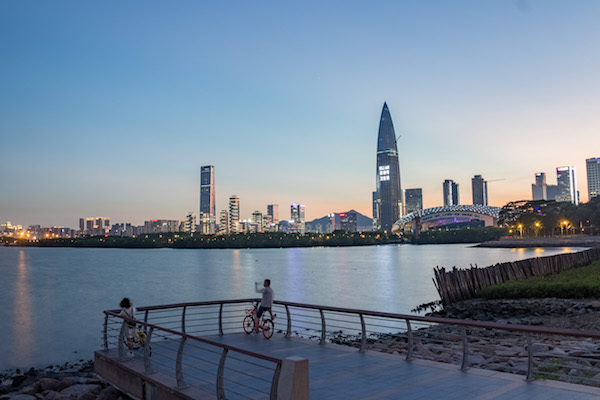 One of the fastest growing cities in the world over the past two decades, this metro area of nearly 20 million in Guangdong Province is part of the Pearl River megalopolis. Named a ‘Special Economic Zone’ in 1980, Shenzen is a major technology hub and a highly visited destination for business and leisure travel. Given the extensive development and dense population, the area is not exactly ‘running heaven’, so you need our guide to find the best places to go running in Shenzen. A running culture is developing in Shenzen, but it’s not as prevalent as in Hong Kong and some other major Asian cities. Shenzen is divided into nine ‘districts’. The signature running spot is the 10+ km that stretches along Shenzen Bay. 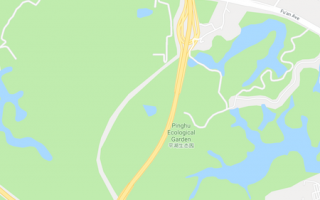 In the central business district of Futian, three interconnected parks — Central, Bijiashan, and Lianhuashan — provide a green, runnable oasis. 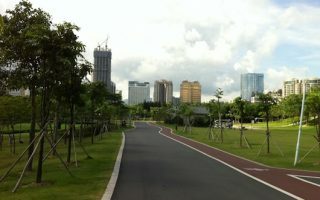 A free and publicly accessible running track is located in Futian Sports Stadium, just to the east of these parks. 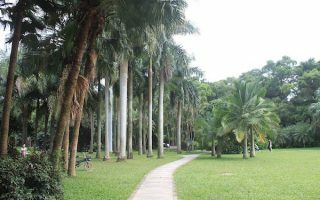 Other good parks for running include Donghu Park in the Luoho District and Dashashe in the Nanshan District. In the northeast part of Shenzen, Pinghu Ecological Garden Park has a good variety of more rugged running. A few notes about running in Shenzen. First, be aware of the heat and air quality, especially in summer, and the fact that there can be monsoonal rains from May-September. Air quality is better than in other major cities such as Beijing, but sometimes not great. Note also that there aren’t a lot of trail maps available online for the parks…but we’ve done our best to consult with local guides. Finally, the transport system is excellent, including the ever-expanding metro and extensive bus lines. The most scenic, longer run in Shenzen. One can run for 10+ km from Hongshuin Nature Preserve, west to Shenzhen Bay Bridge at Wanghai Rd. Great views of Shenzen Bay, Hong Kong Mountains, bridge to Hong Kong. We've mapped segment distances too. These three fairly large and interconnected parks are your best bet for running in the area. Central park is nicely landscaped with a river, Bijiashan has hilly, shaded trails, and Lianhuashan has woods, fields, and a lake. A decent escape in the otherwise busy Nanshan area. One can put together a ~1.5 km loop of the park. Add by running along the Dashe River on Yanhe Rd., which heads south from Dashahe Park for a few km, two golf clubs. One of the largest and prettiest parks in Shenzen. Located in the Luoho District. Lovely paths, some rolling hills, a man-made lake, and several landscaped gardens. One can put together a few km, or it's ~2 km from northwest gate to south gate. A worth-it destination if you'd like to get off road and see some green. Several km of running possible, mix of rugged roads, gravel paths, woodland paths, and concrete roads, both flat and hilly. Longgang District, northeastern Shenzen. Shenzen has a humid, subtropical climate, influenced by the monsoonal flow. Summers are hot, wet, and humid. Average highs are in the 32C (90F) range, and rarely dipping much below 25C (77F) at night. Most of the 2,000mm (78 inches!) of annual rainfall occurs from May-October, in the form of torrential downpours. If you run enough in Shenzen you will get drenched at some point! 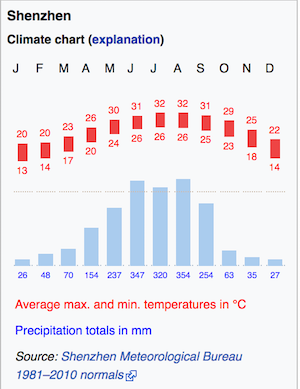 Winters are relatively mild – average high temps are 20C (68F) and nights dip into the 13C (mid-50s) range. Fog can occur in Shenzen fairly frequently. There are several stores of major running brands such as Asics and Nike, and plenty of places to buy running gear. No independent, running-centric stores that we are aware of. See our overview map on Shenzen home page. Ahotu running calendar for running events in China. Half Marathon in Nanshan. November.